| STEP 1 | Begin by cutting the thread to about 4 inches long, then thread them through the upper part of the basket and connect it to the other basket, loop it just one time across each basket. Then tie a knot and cut of the left over thread (see photo below) to secure baskets. | STEP 2 | Start gluing each of your ornaments on to the baskets (before you glue each piece, I suggest you do a pre-arrangement of how you want your ornaments placed), make sure you let the glue dry so that you can test how secure the pieces are inside. | Step 3 | This is how your wreath would look like once all ornaments have been glued to each of the baskets. You can place as many pieces as you want, but I find it to look better with with one or two pieces. | STEP 4 | Cut about 9 inches of ribbon, this ribbon will serve as the hanging prop for your wreath, then cut another piece of ribbon about 12 inches to make a bow (see photo below). | STEP 5 | Place ribbon where you want it to lie, and begin to add glue to the area. | STEP 6 | Let all the glue of the ornaments and ribbon dry so that they stay put (I recommend you let everything dry overnight). 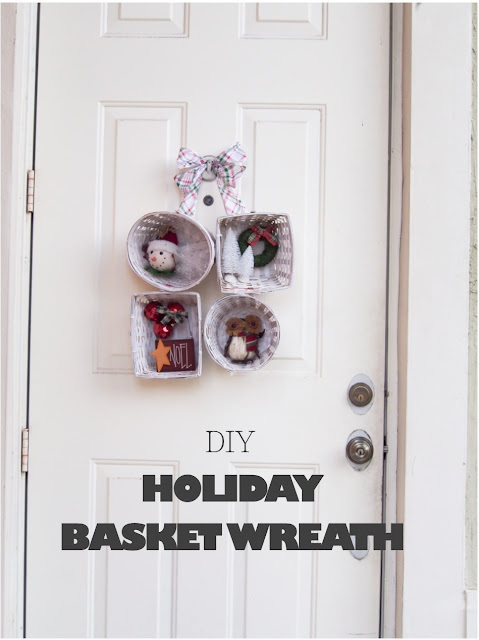 Once the glue is dry, you have completed your basket wreath and you can either hang it outside the main door of your home or inside your home. Today I bring you this one of a kind DIY project, for which I teamed with blogger friend Kara from Sprinkles in Springs, for the second time (see our previous collaboration HERE), see her version of the basket wreath HERE. I love how different both of them look yet we both unknowingly went for the rustic, wood cabin-like look. I chose this look because as some of you may know I am back home in Miami, visiting family and I am staying with my mom while in town. Since I knew I wasn't going to be able to do my project back in my own home, I had to chose ornaments that went well with my mother's holiday theme, which was that rustic look and I got lucky to find adorable pieces on super sale at Micheal's, but I also found some of the items at the Dollar Store and Lucky Clover Trading Co.
We wanted to create something different, that incorporated elements of traditional decor pieces but in a new and creative way. I think we achieved it, don't you think? do you like the idea of a basket wreath to replace the traditional wreath? BTW my mother loved her basket wreath. How creative is this!?!?!?! BRAVO.